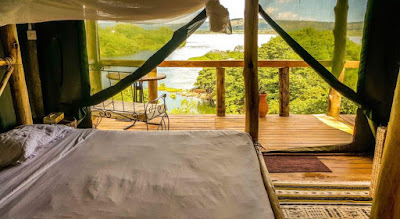 African Pearl Safaris: Relax on The Nile at Living Waters Resort. Relax on The Nile at Living Waters Resort. Living Waters Resort boasts of a beautiful view of the source of the Nile among many other spectacular things fit for the curious tourists. At the point from which John Hanning Speke beheld the source of the Nile, lies a spectacular monument which also features on the back of the Sh 2,000 currency note. It gives a clear view of the boundary where Lake Victoria, Africa’s biggest freshwater lake ends and where River Nile, the world’s longest river starts, going through Sudan and Egypt before eventually joining the Mediterranean sea. Living Waters Resort features luxuriant bandas and a restaurant not to mention a vast camping space with plenty of trees, whose fresh air and green cover combined with the magical view of the Nile, make the Resort the ideal hideout for anyone looking to relax, loosed up and be relieved of any stress. This place presents a great getaway for families and honeymooners in quest for privacy and intimacy. Sightseeing around the Nile is done on a wooden engine-powered boat and it ushers in the floating village, the statue of Mahatma Gandhi’s bust, fish farms and fascinating historical pillars. The bird watching expedition downstream is always a delight to those who love the avian species. Many of the birds there are from the Kingfisher family and the excitement lies in seeing them hover over calm stretches of water for as long as two minutes before taking a swift dip to catch fish that is almost twice their body size. Entrance fee to the source of the Nile is shs3,000, shs5,000 and shs10,000 for Ugandans, foreign residents and foreign non-residents respectively. Camping at the gardens of Living waters Resort Costs sh15,000 per night (own tent) per person. A night in the bandas costs $110 for bed and breakfast per person. Full board is $150 per person. From Kampala, turn right at Nile Breweries in Njeru Town. Do not cross over the bridge at Owen Falls Dam, but keep going on Nalubale Road. Go past Picfare Industries, Nytil and Vitafoam and thereafter follow the signs for Living Waters Resort.